"THE SON OF MAN MUST SUFFER GREATLY"
This Sunday, we are reminded that Jesus must suffer greatly in order to purify us from our sin. Our first reading (Zechariah 12:10-11; 13-1) is a prophetic proclamation by God to the people of Israel as they return from captivity and begin to rebuild their temple. They are instructed that their mourning and trials are the means to their purification from sin. It is a prophesy that can only be fulfilled by Christ himself. "Thus says the LORD: I will pour out on the house of David and on the inhabitants of Jerusalem a spirit of grace and petition; and they shall look on him whom they have pierced, and they shall mourn for him as one mourns for an only son, and they shall grieve over him as one grieves over a firstborn. On that day the mourning in Jerusalem shall be as great as the mourning of Hadadrimmon in the plain of Megiddo. On that day there shall be open to the house of David and to the inhabitants of Jerusalem, a fountain to purify from sin and uncleanness." In our Gospel passage (Luke 89:18-24) Jesus is identified by Peter as "the Christ of God". At hearing that, Jesus scolded his disciples to tell no one and he began to teach them what being the Christ really meant, that he must suffer greatly and be killed.
. "Once when Jesus was praying by himself, and the disciples were with him, he asked them, 'Who do the crowds say that I am?' They said in reply, 'John the Baptist; others, Elijah; still others, 'One of the ancient prophets has arisen.'' 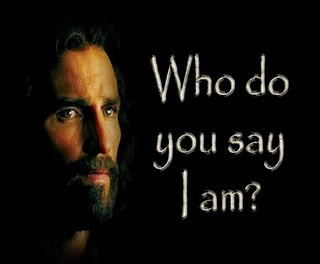 Then he said to them, 'But who do you say that I am?' Peter said in reply, 'The Christ of God.' He scolded them and directed them not to tell this to anyone.He also taught them what that would entail for them. "He said, 'The Son of Man must suffer greatly and be rejected by the elders, the chief priests, and the scribes, and be killed and on the third day be raised.' Then he said to all, 'If anyone wishes to come after me, he must deny himself and take up his cross daily and follow me. For whoever wishes to save his life will lose it, but whoever loses his life for my sake will save it.'" In our Epistle reading (Galatians 3:26-29), St. Paul tells his community of the universality of Christ's church and that we all are heirs to the promise. "Brothers and sisters: Through faith you are all children of God in Christ Jesus. For all of you who were baptized into Christ have clothed yourselves with Christ. There is neither Jew nor Greek, there is neither slave nor free person, there is not male and female; for you are all one in Christ Jesus. And if you belong to Christ, then you are Abraham's children, heirs according to the promise." It is only through the suffering, death and resurrection of Christ that we receive the Spirit of grace and petition, the fountain to purify us from sin and uncleanliness. Thus we become heirs to the promise, we, who through our baptism and through our actions, clothe ourselves with Christ.